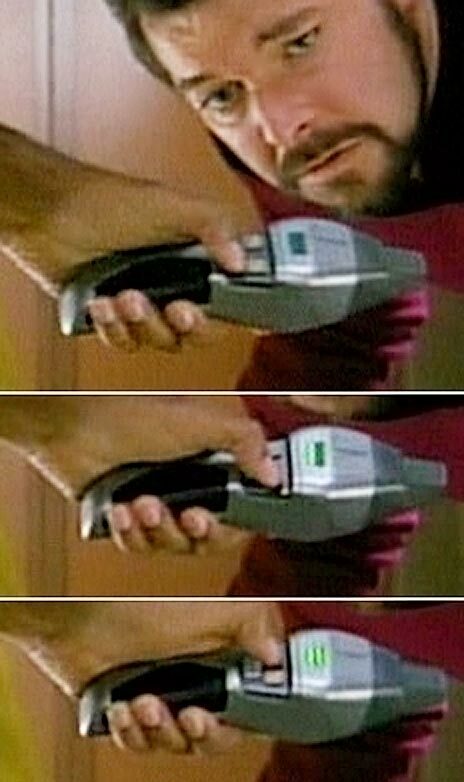 Hand phaser with 16 settings. 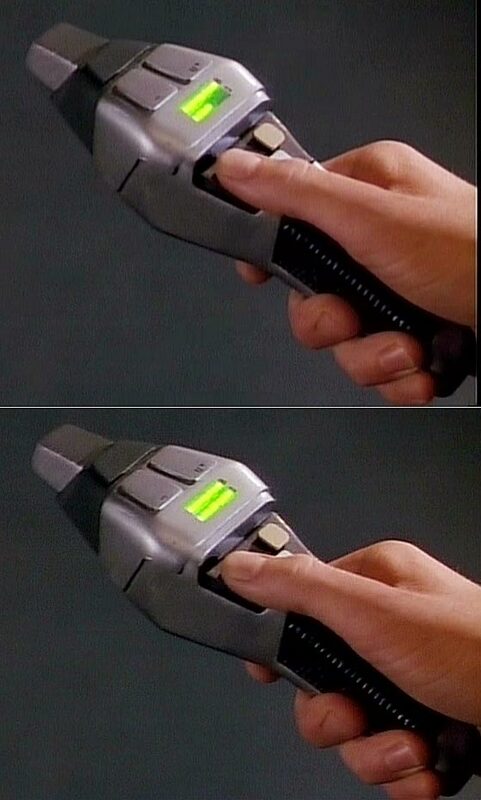 Basic controls were three main buttons: Beam Intensity (forward, left), Beam Width (forward, right) and the trigger. 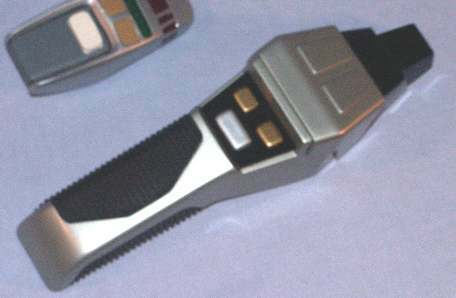 The beam control assembly includes the controls which alter the beam's intensity and width, as well as the trigger. 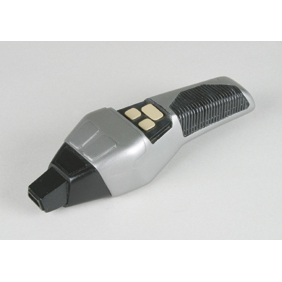 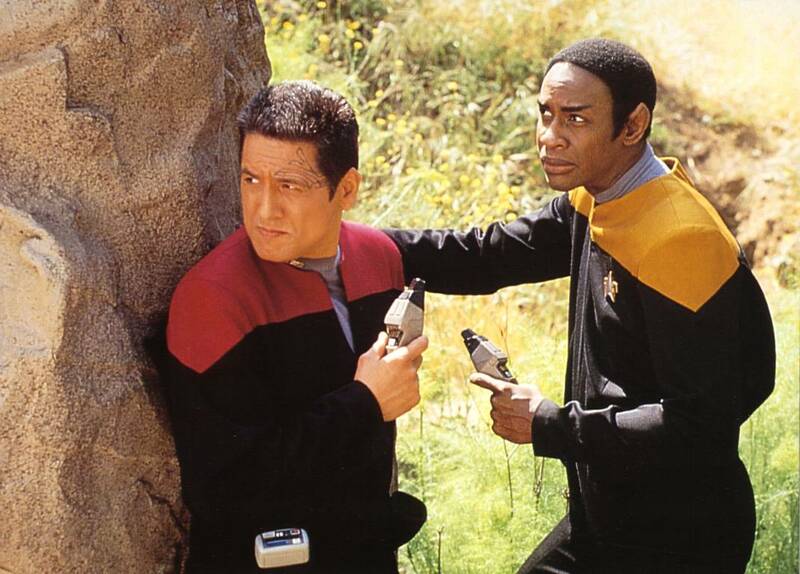 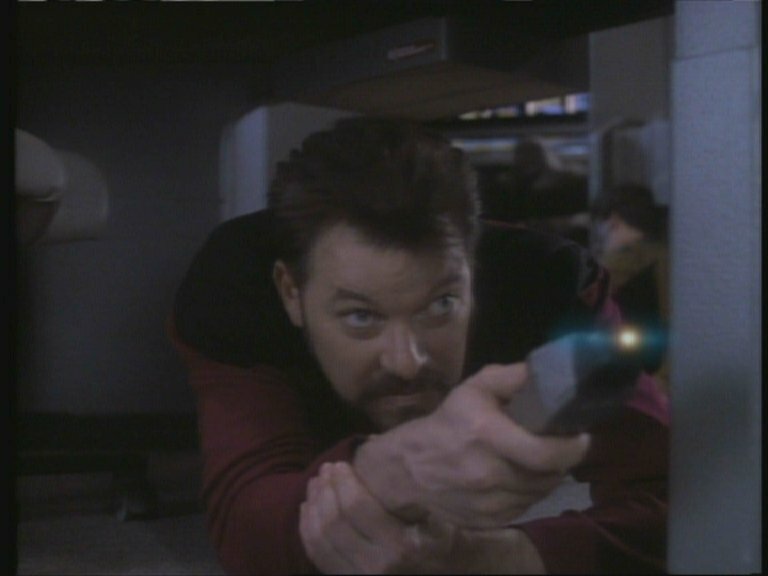 The safety interlock is used to identify and check the person using the phaser. 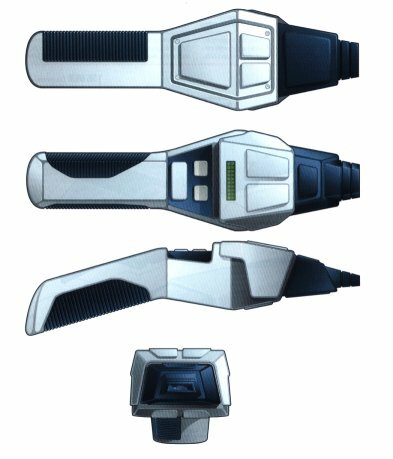 The STA is used as part of the safety system whilst on a Federation starship, automatically limiting power levels during firing when on board, usually to no more than heavy stun; it also has additional target sensors and processors for distance aiming. 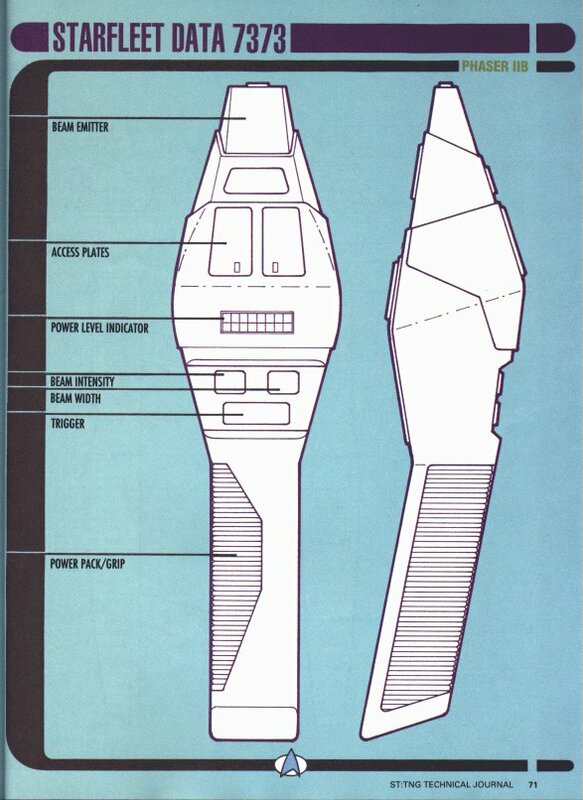 Energy from the power cell passes through all three modules and is then routed through shielded conduits to the prefire chamber, a sphere of gulium arkenide-reinforced LiCu 521, 1.5 cm in diameter. 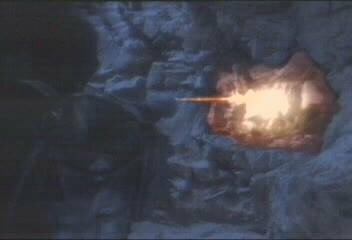 This energy is stored temporarily by a charge barrier, which then collapses the energy, discharging it through the LiCu (the 'emitter crystal') as a pulse of energy. 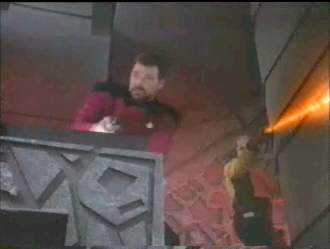 The charge barrier collapse takes an average of 0.02 picoseconds, whereupon through a 'rapid nadion' effect the LiCu emitter converts the pulse into a tuned phaser discharge. 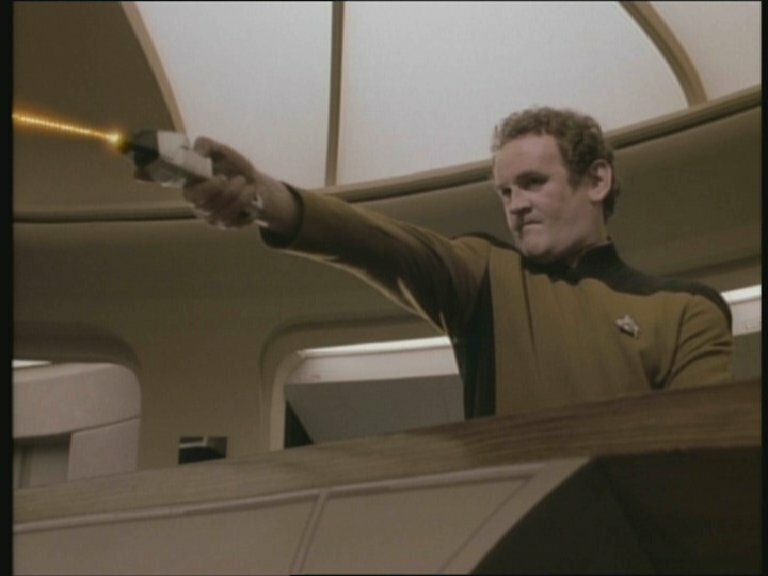 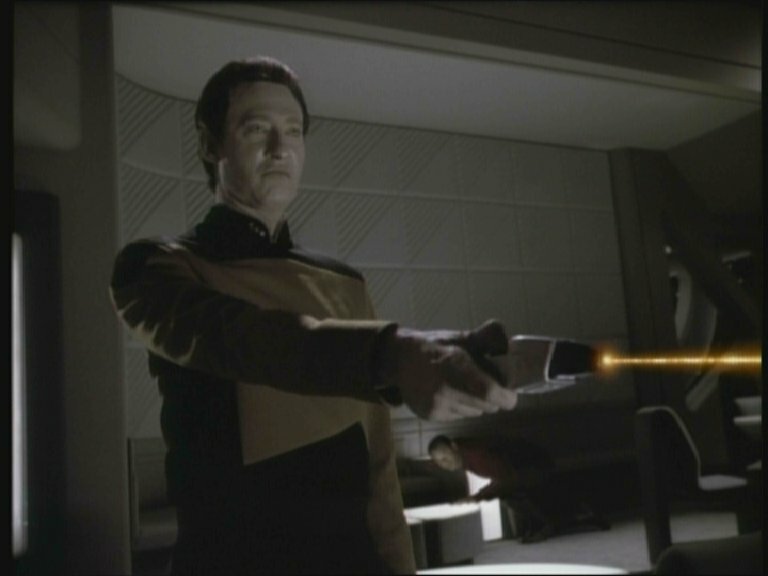 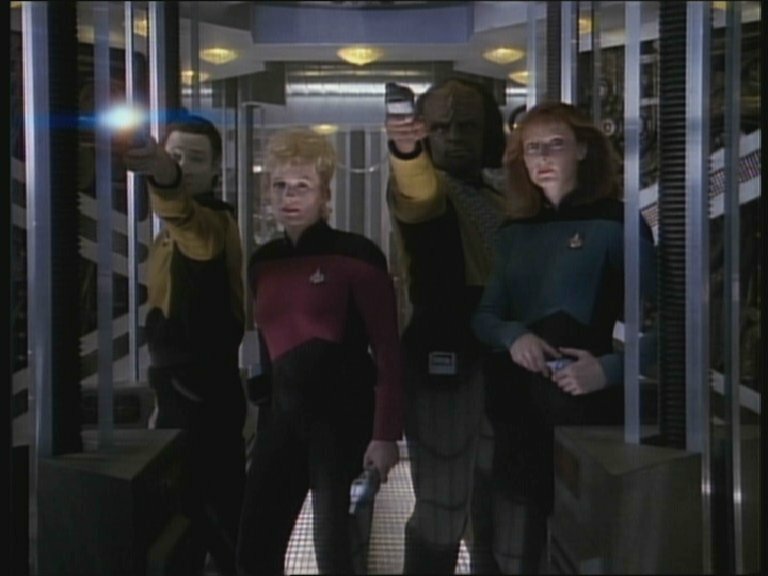 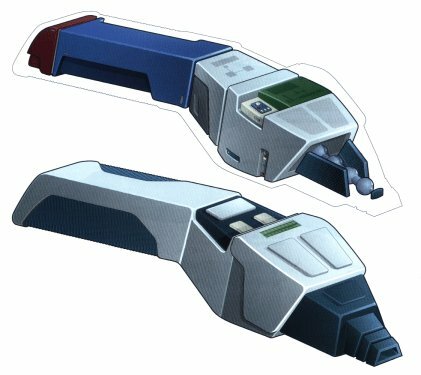 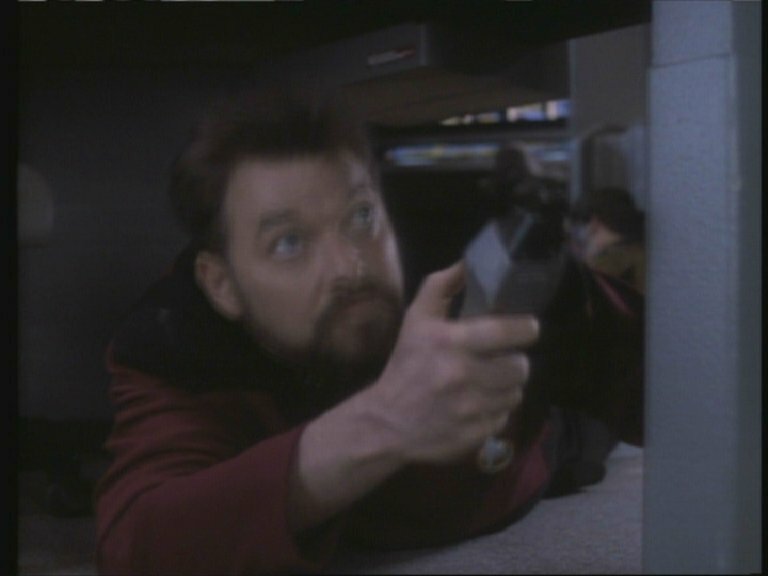 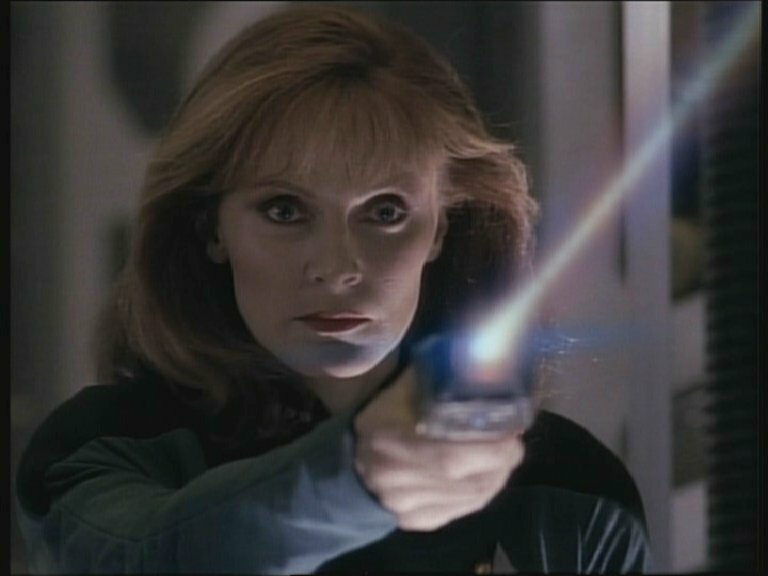 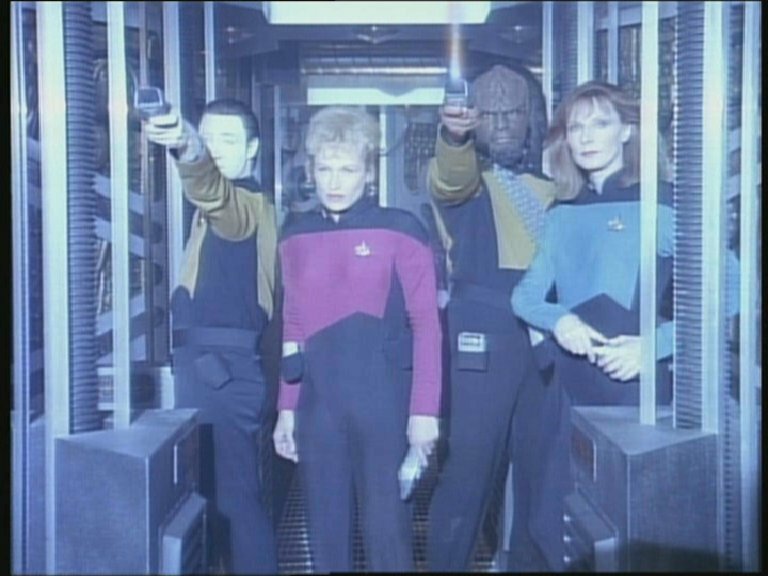 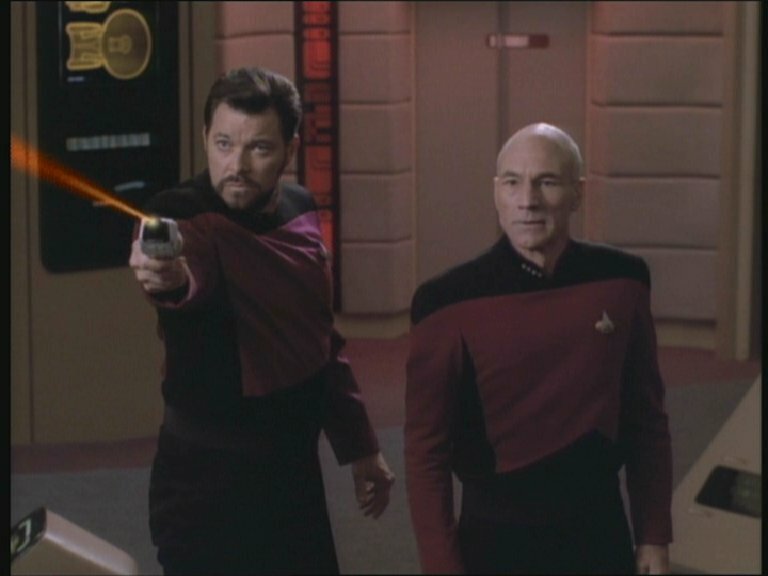 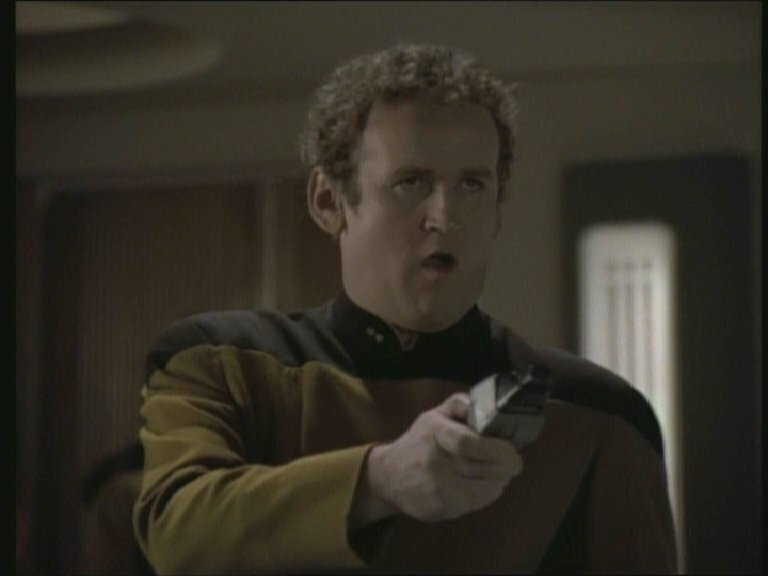 As with a ship's main phaser banks, the greater the energy in the prefire chamber, the higher the percentage of nuclear disruption. 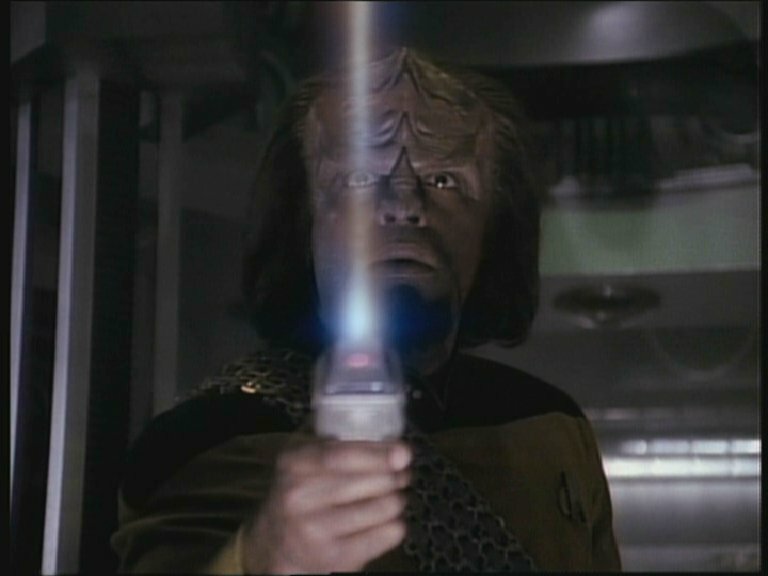 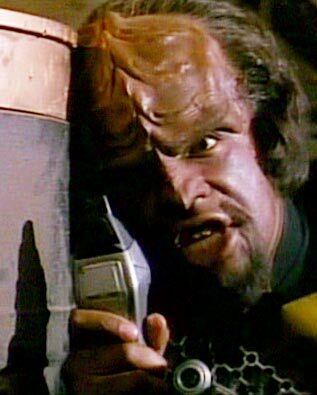 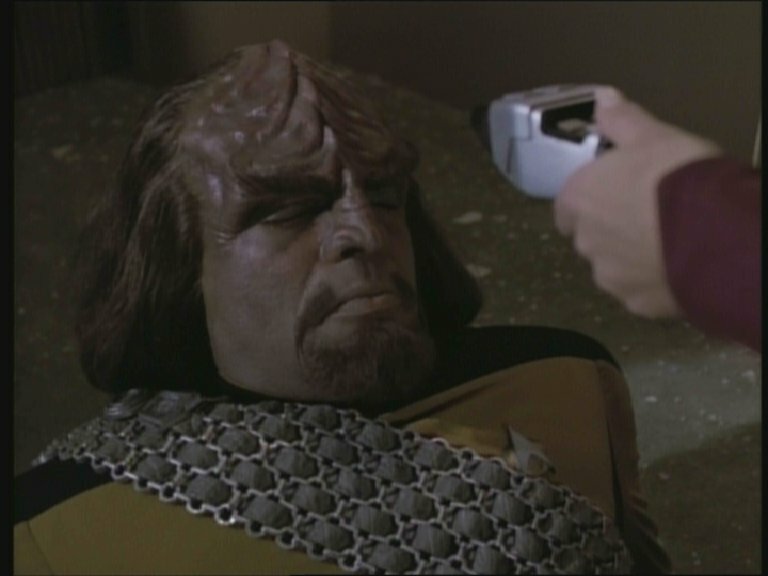 Low to moderate phaser settings are calibrated to fall short of this nuclear disruption threshold, limiting the phaser discharge to stun and thermal electromagnetic effects. 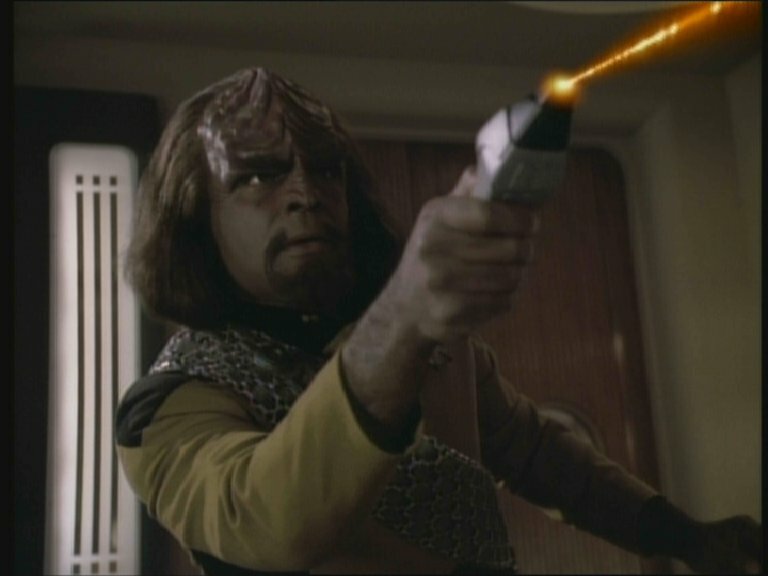 Phaser Settings. 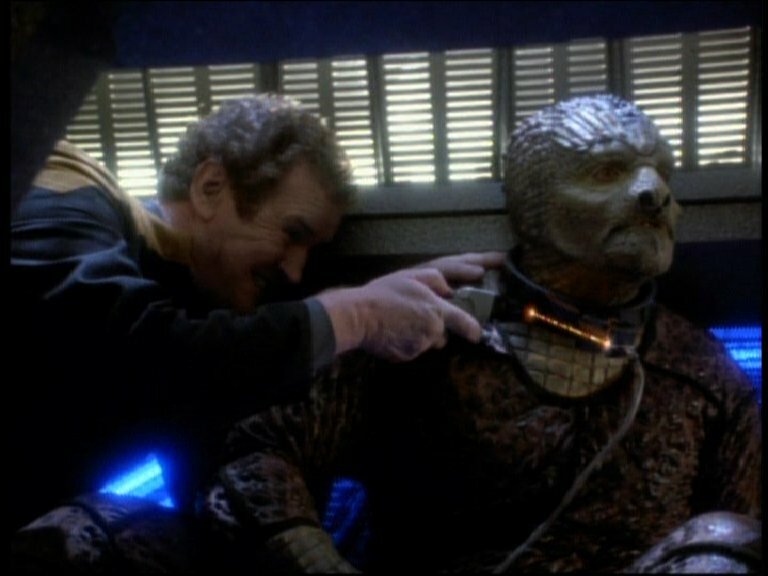 This was more like it! 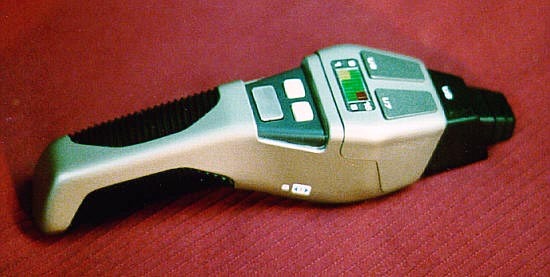 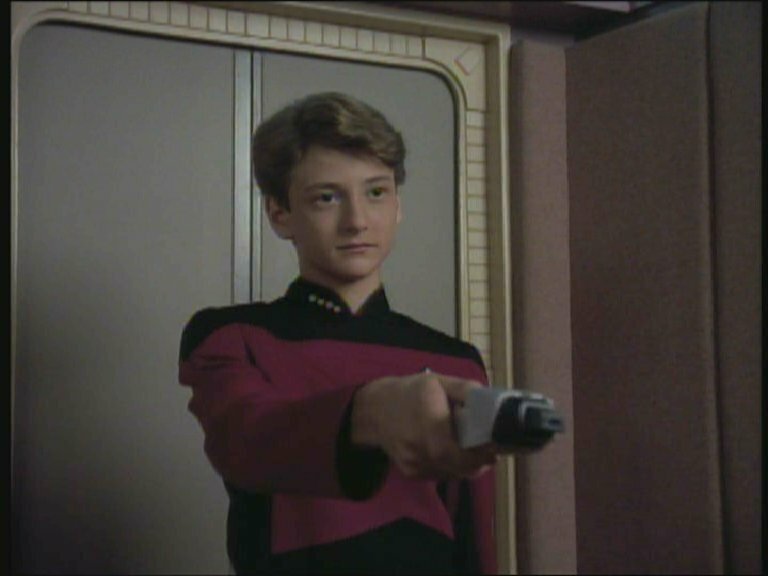 We know a fair bit about this model - the "Cobra Phaser" - since there's so much information in the TNG Tech Manual. 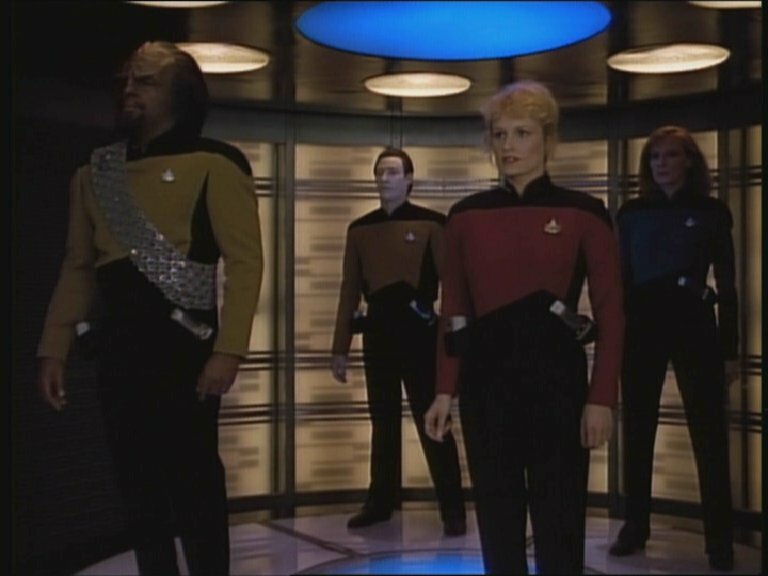 Mind you, when seen again in TNG, older episodes of DS9 and first-season Voyager it now looks so bulky compared to the Voyager-era version! 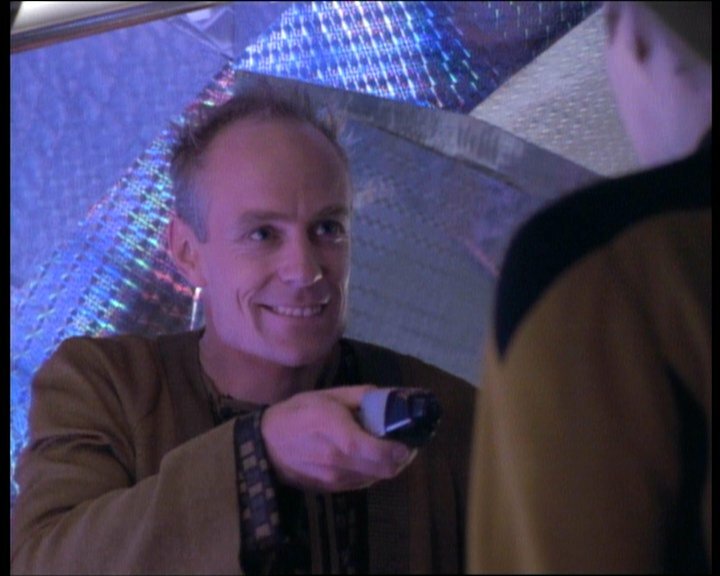 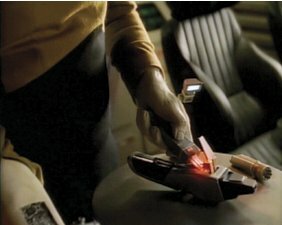 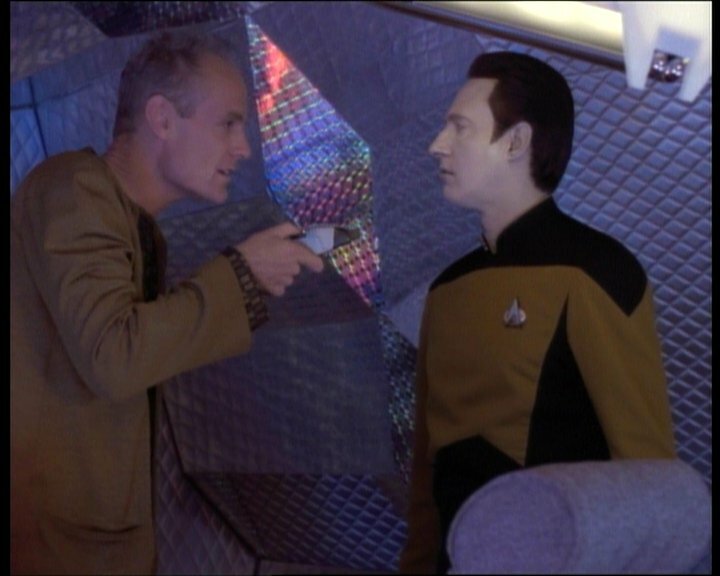 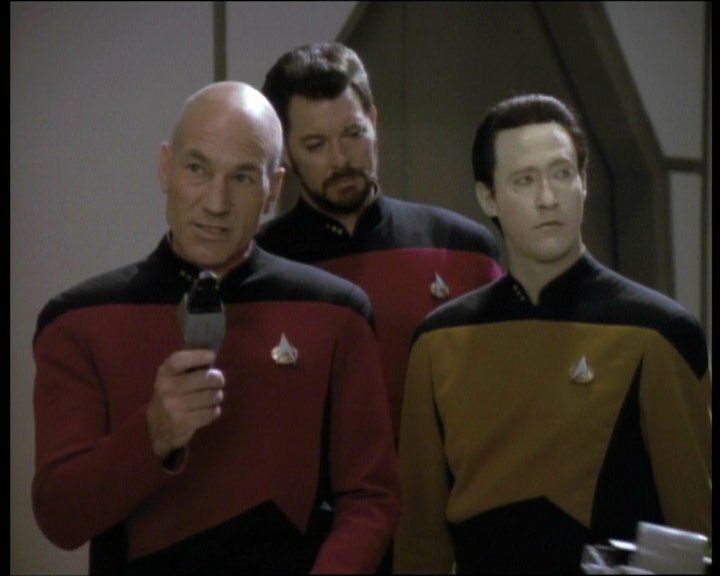 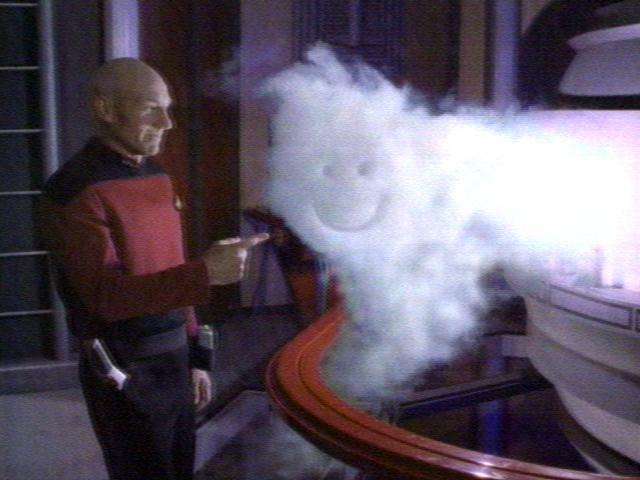 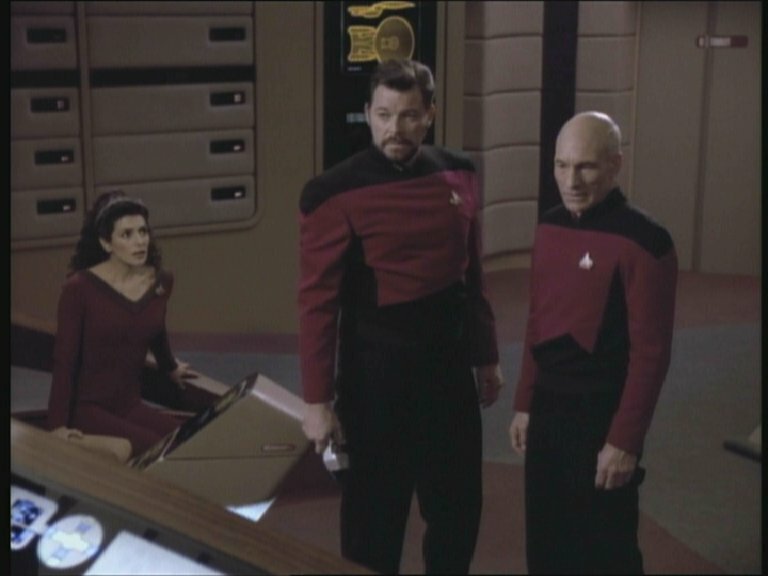 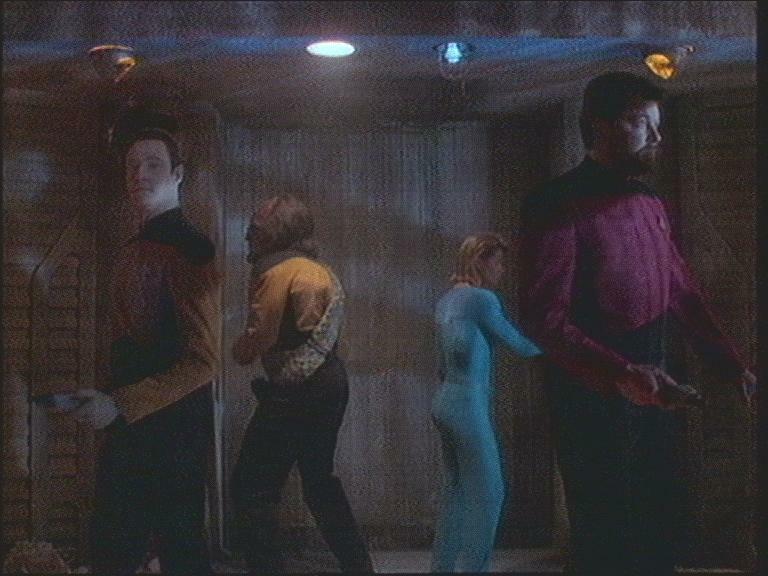 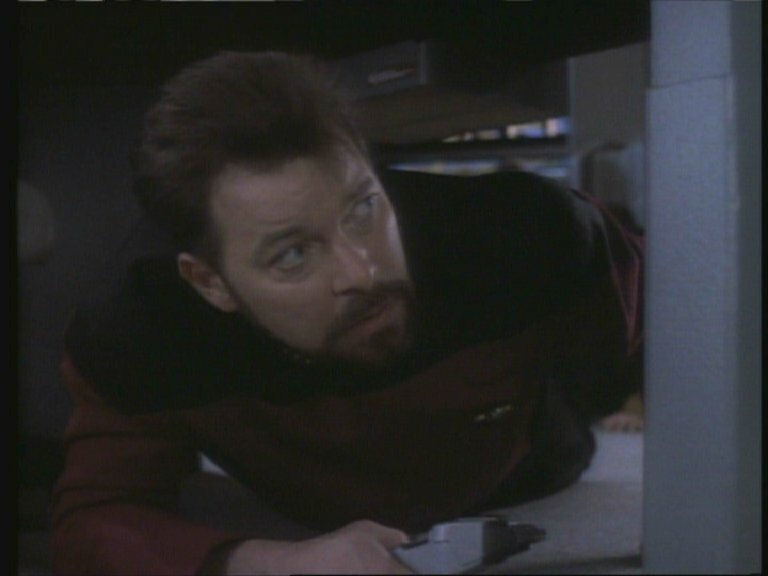 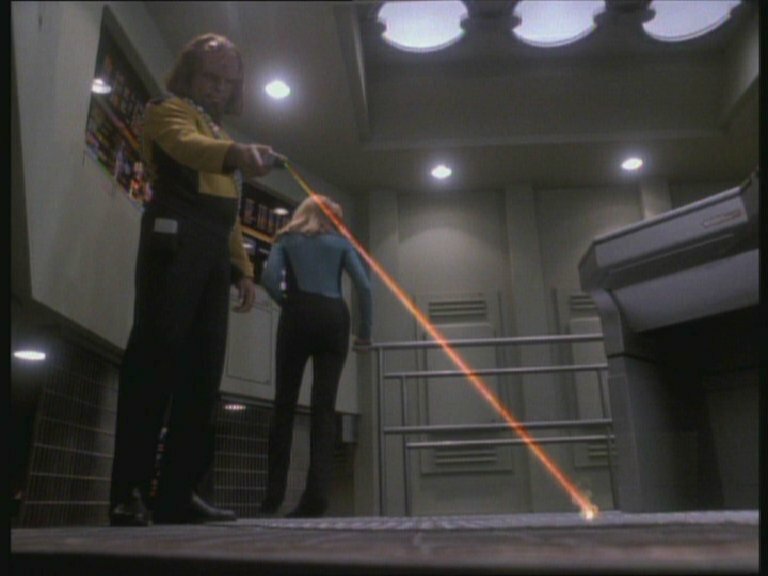 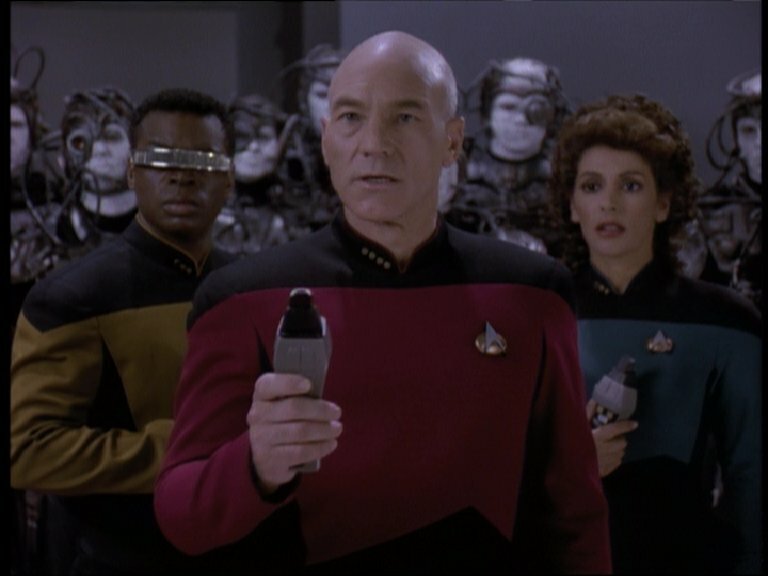 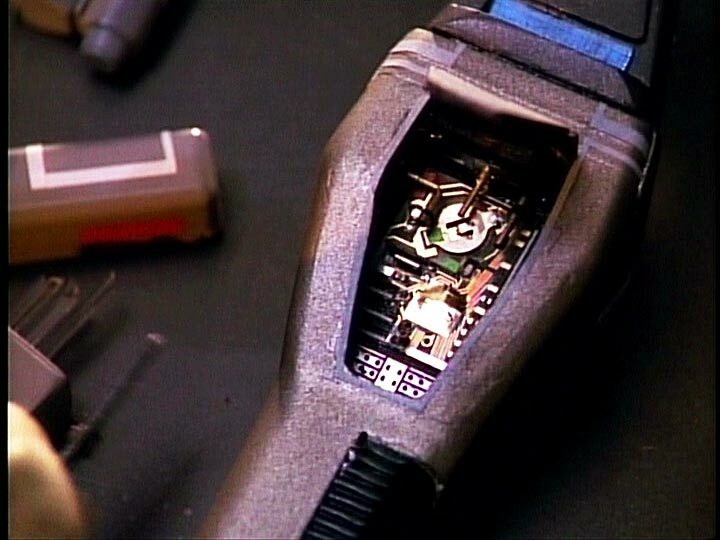 One feature which has been revealed about this model, and presumably all subsequent ones, is that it can be deactivated by remote computer control, as demonstrated in TNG's "A Matter Of Time." 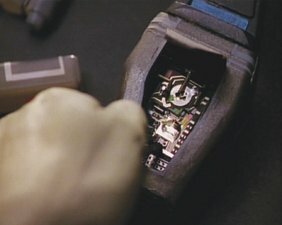 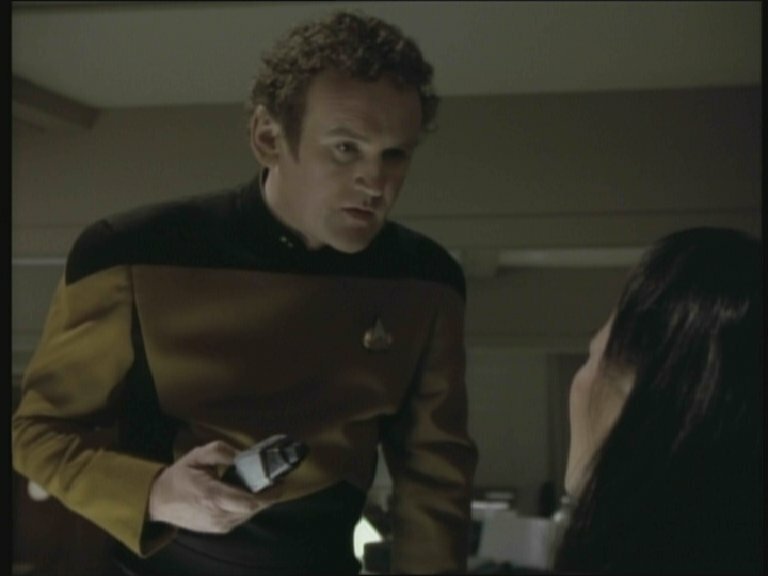 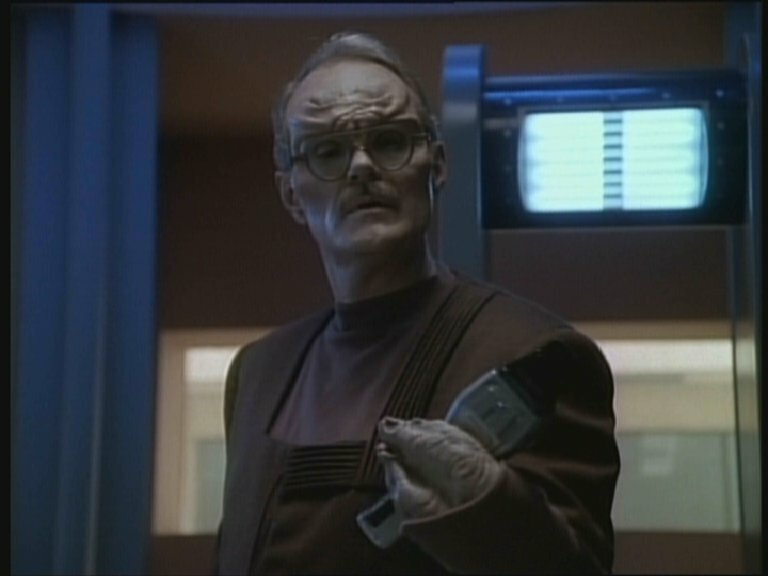 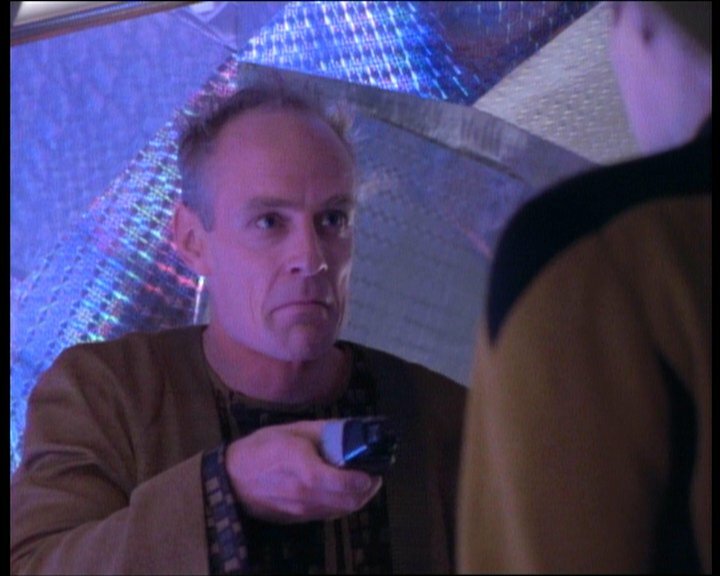 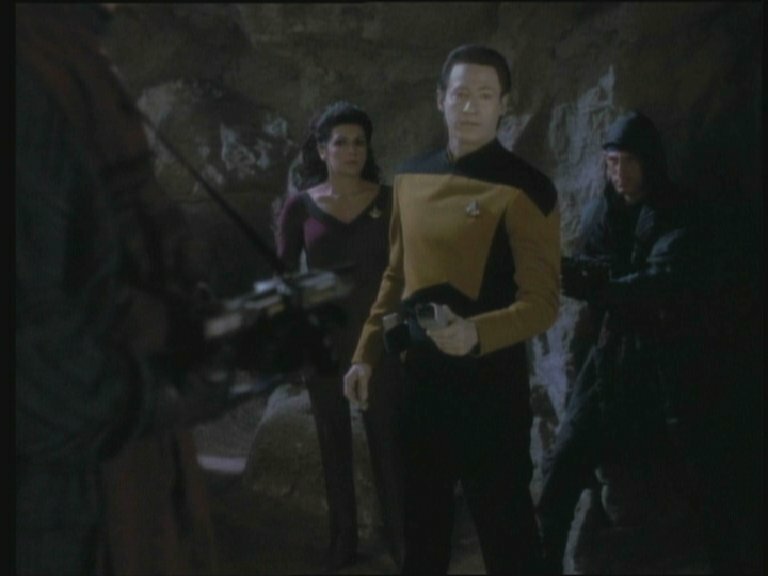 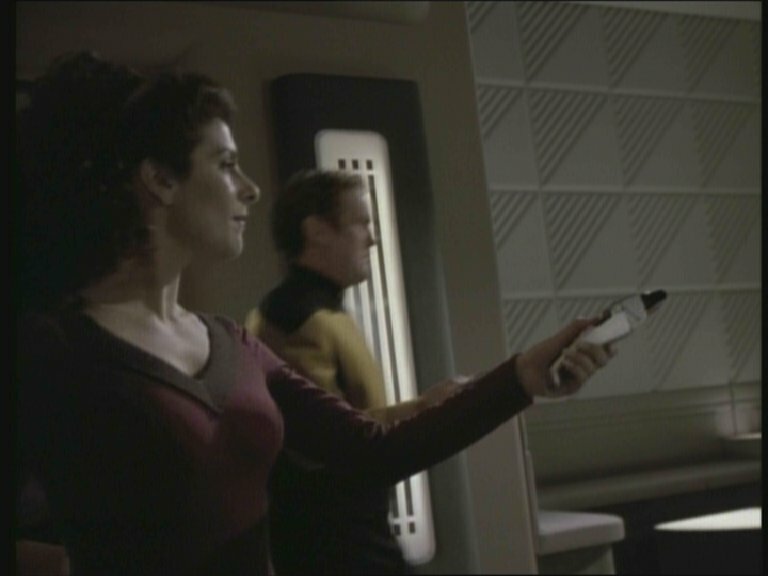 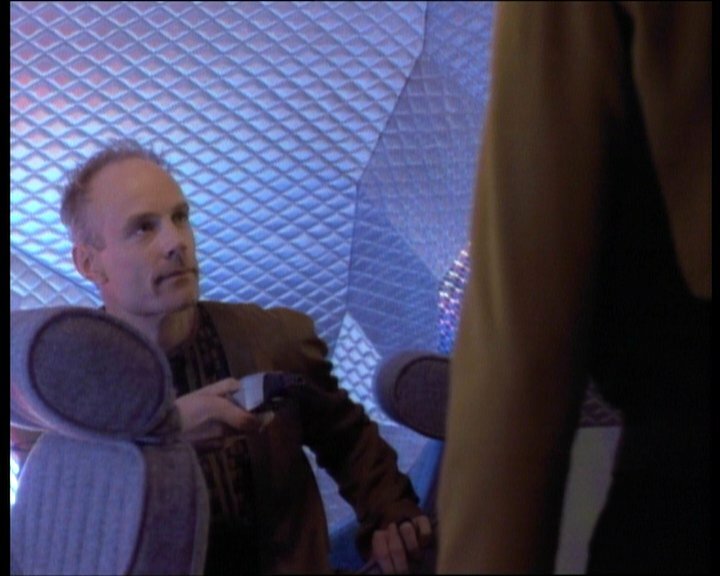 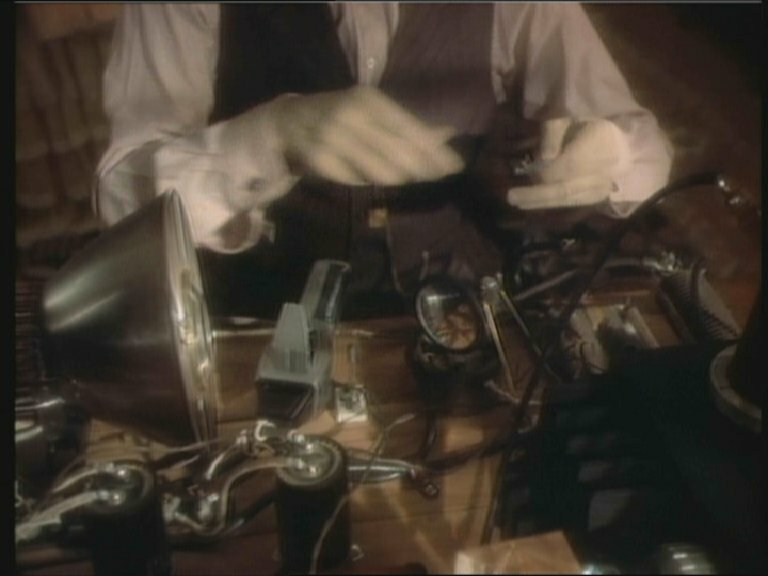 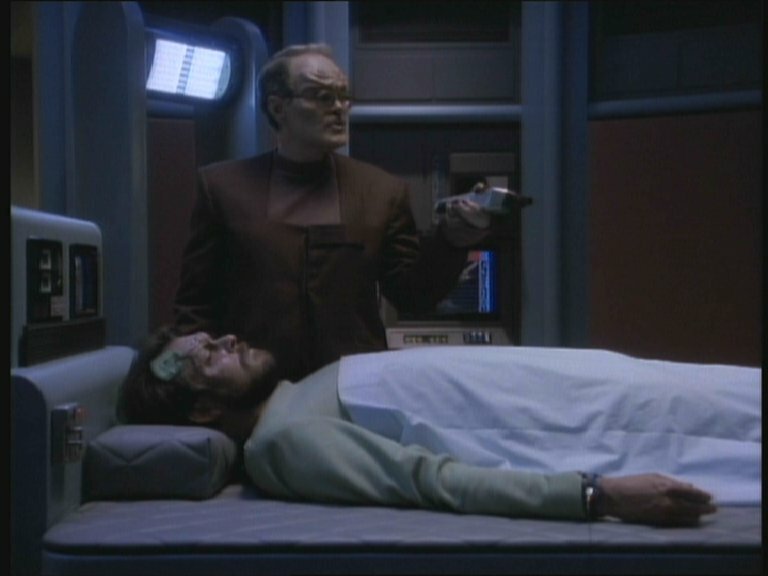 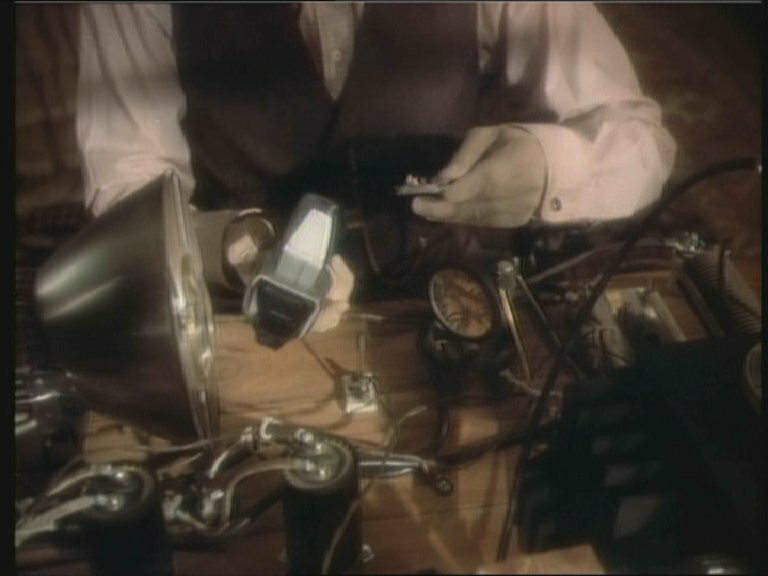 Of course, I can't recall any other instances of this being done - once again, an example of bad continuity for dramatic reasons. .
One prop was constructed from vacu-form plastic, with a hinged door in the bottom which opened to reveal circuitry; this was used by Data in the episode "The Ensigns of Command", where he uses part of his own neural subprocessor to build a "smarter" phaser, one which will counteract the hyperonic radiation on Tau Cygna V that randomizes phaser beams, rendering them useless. 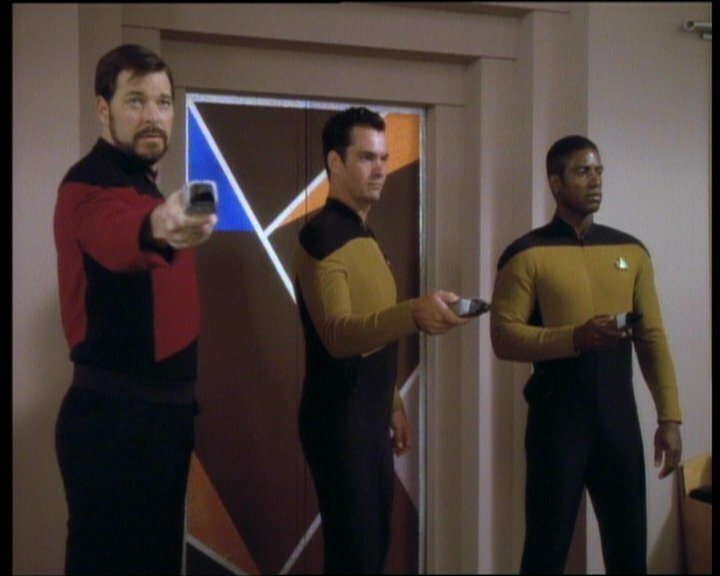 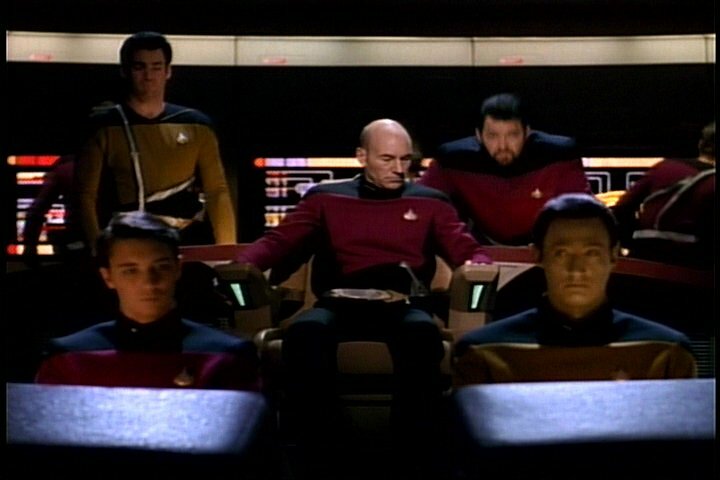 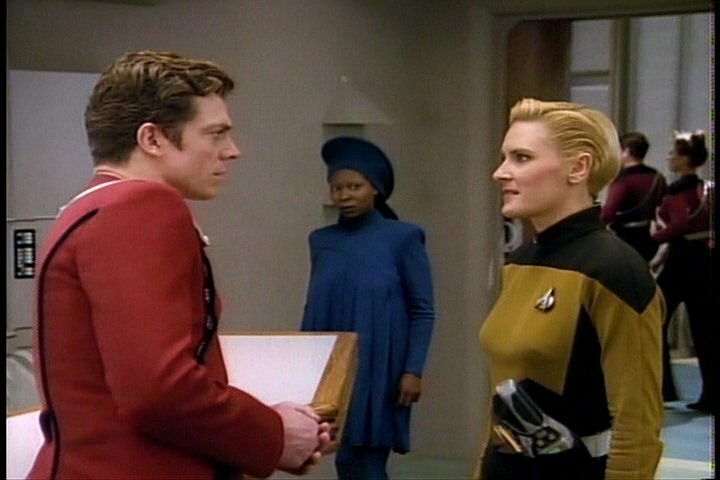 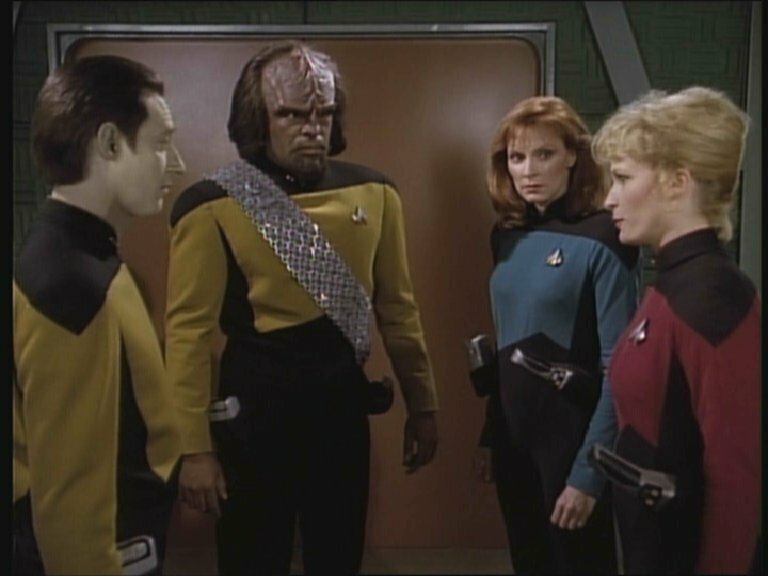 I've recently been reminded that in the TNG episode "Lessons" science officer Lt. Cdr. 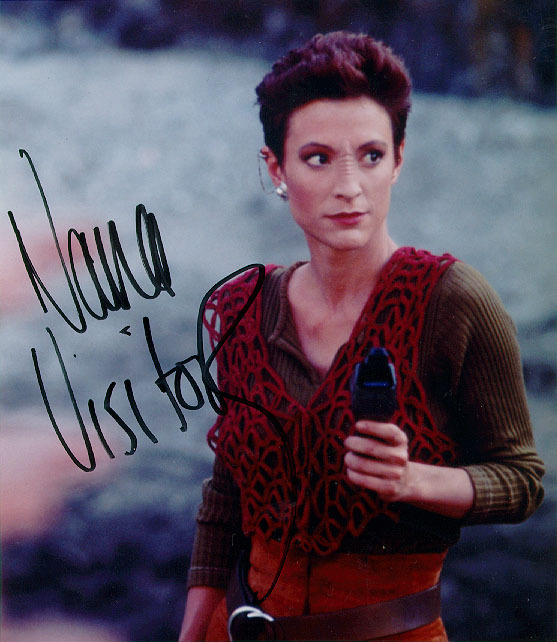 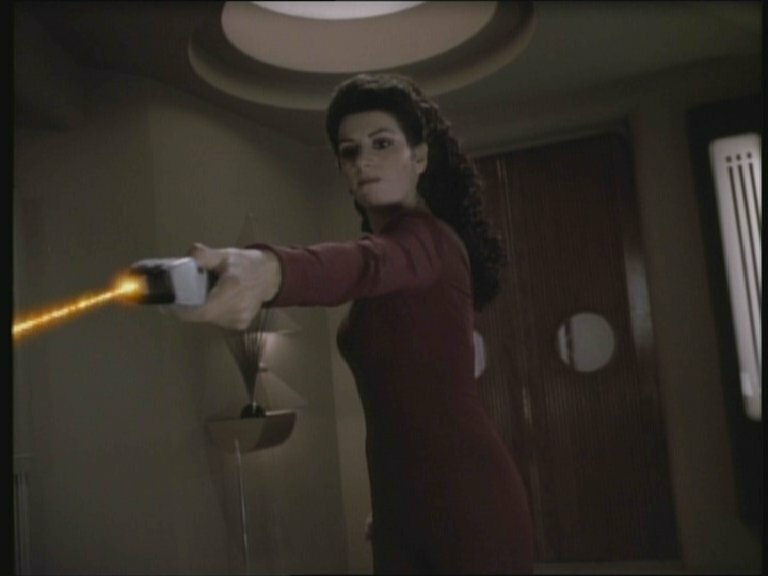 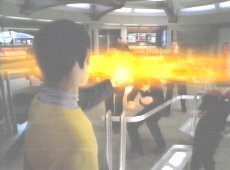 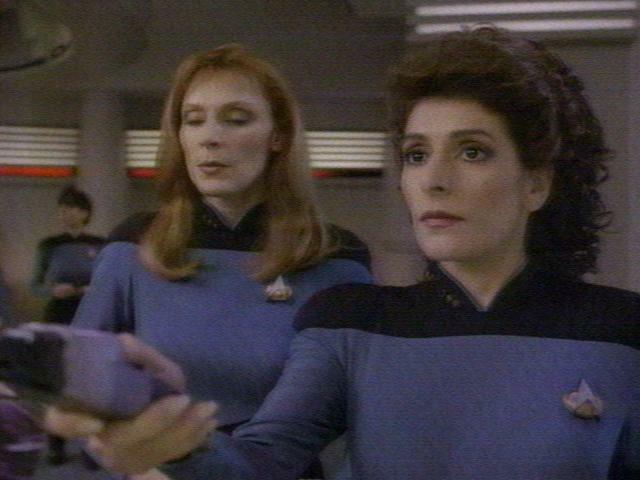 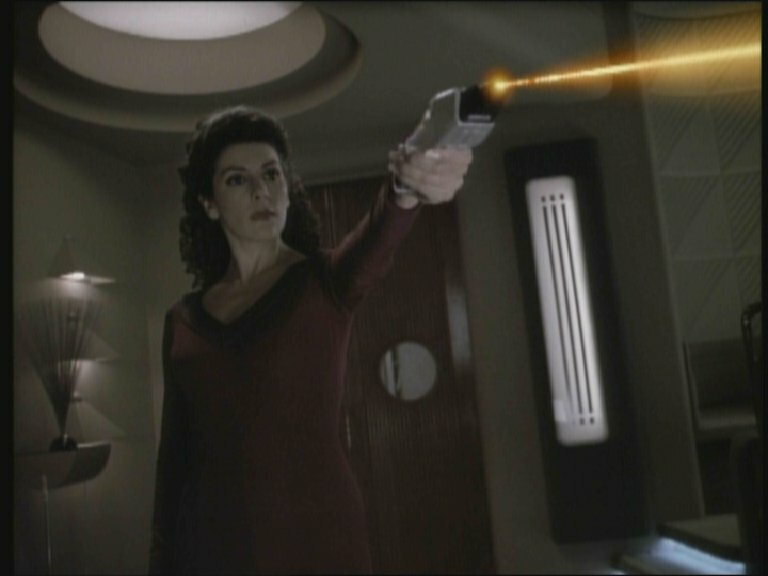 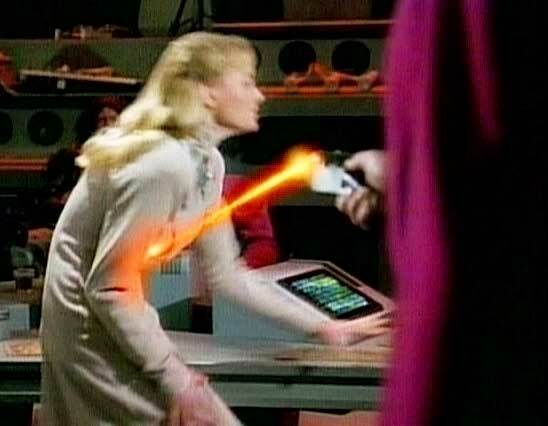 Nella Daren used her away team's phasers to create a forcefield to hold off firestorms on the planet Bersallis III. 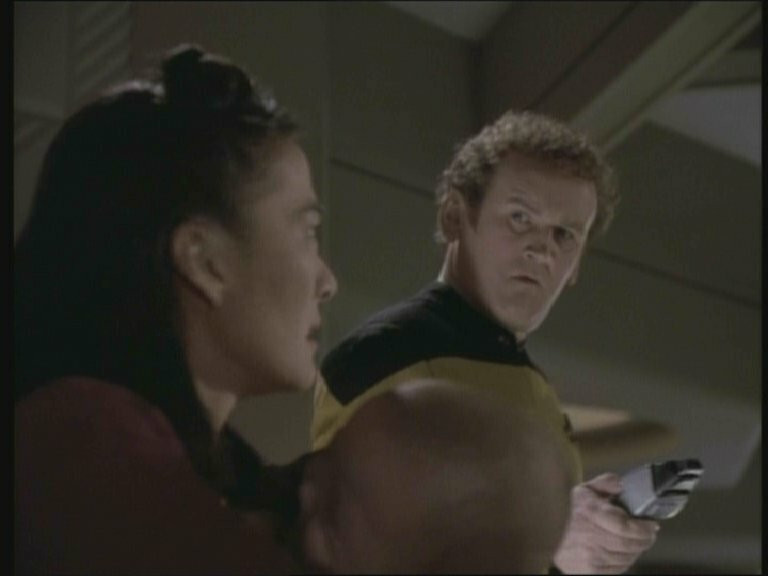 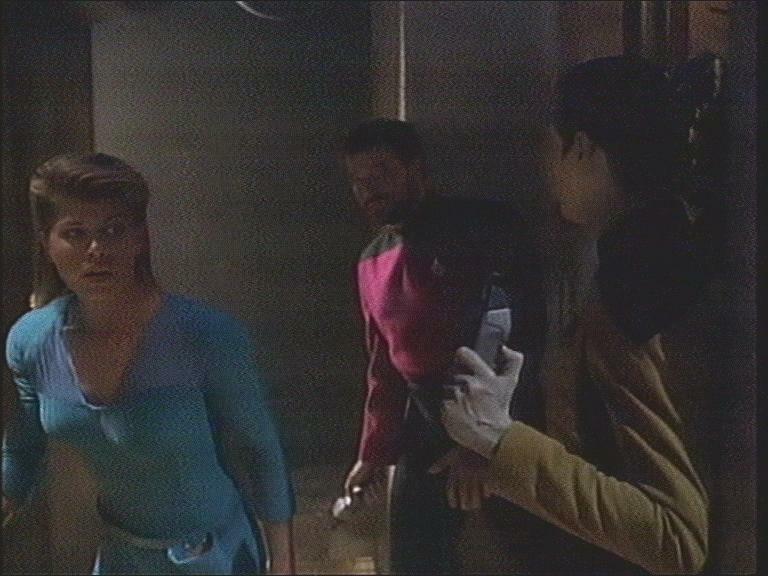 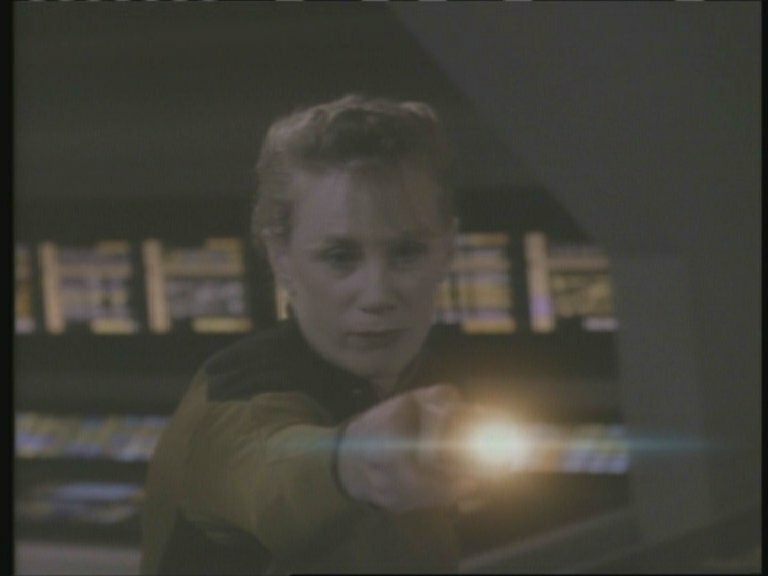 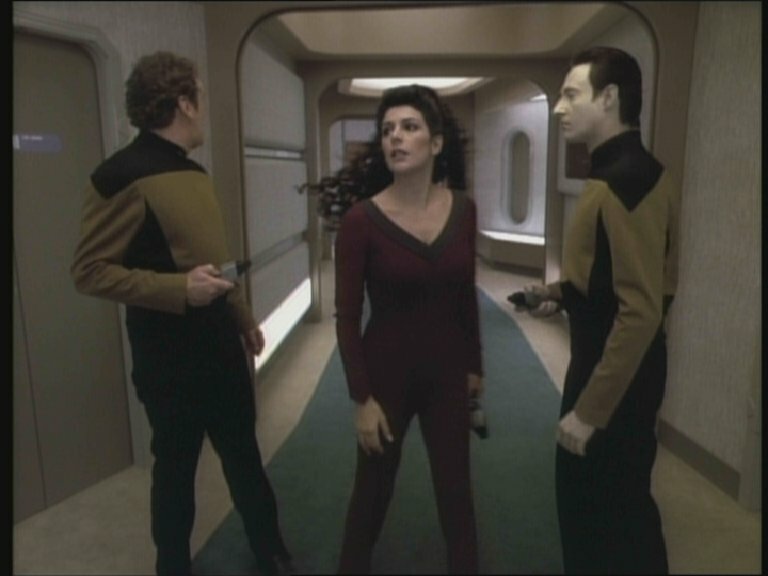 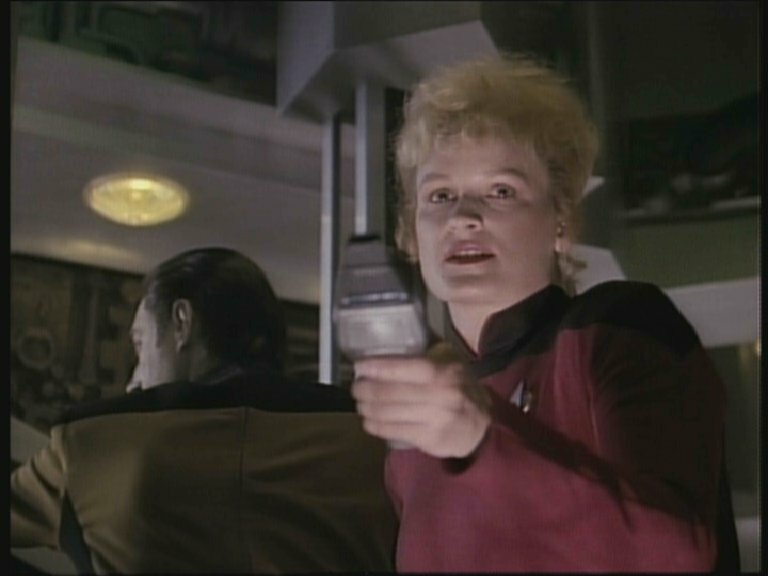 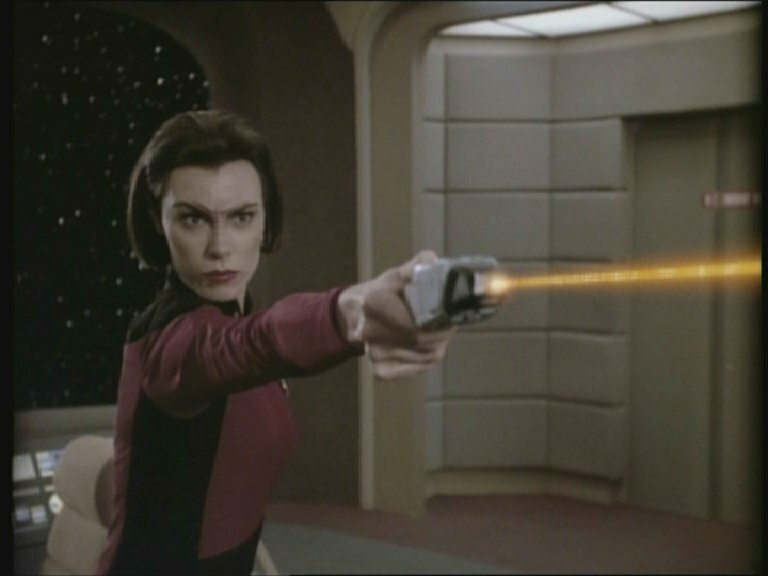 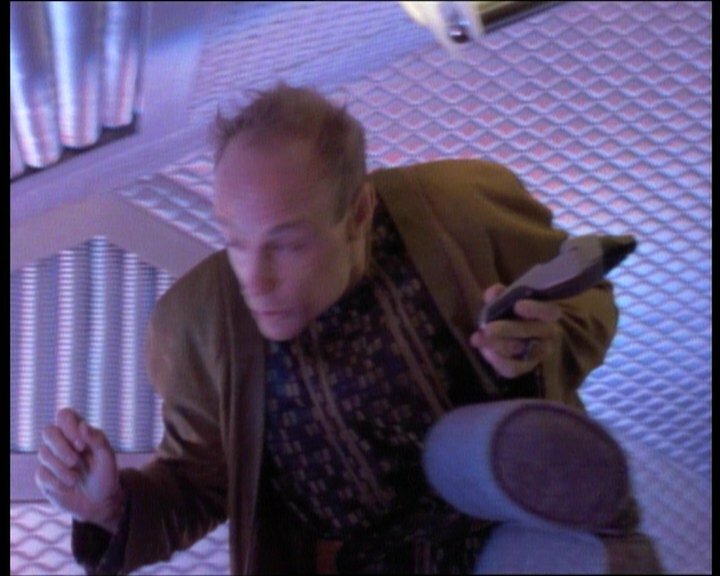 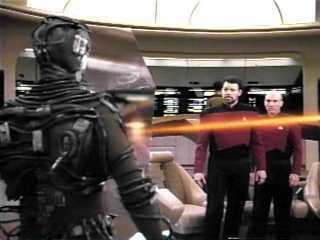 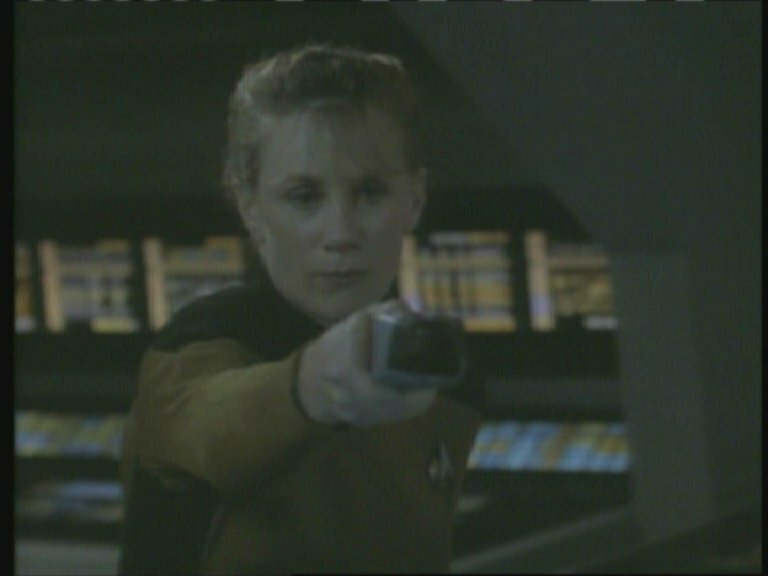 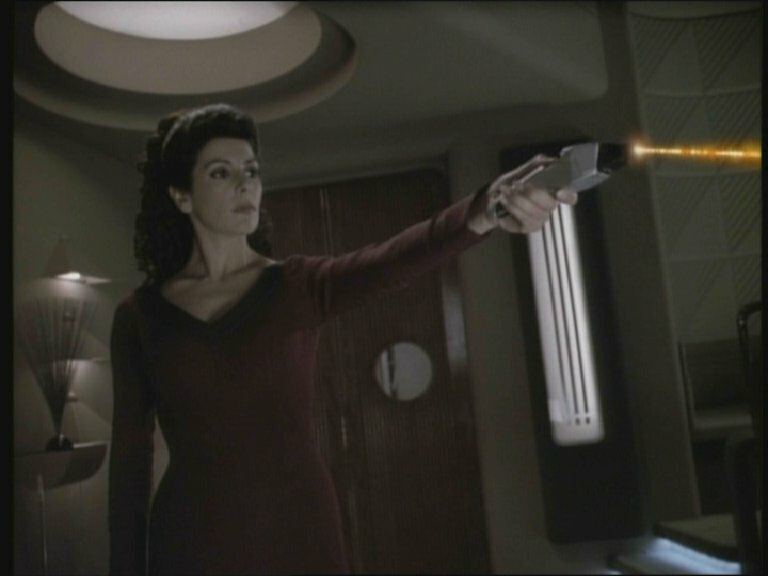 How this was done isn't clear, but she may have used a similar method to B'Elanna Torres with a later-model phaser. 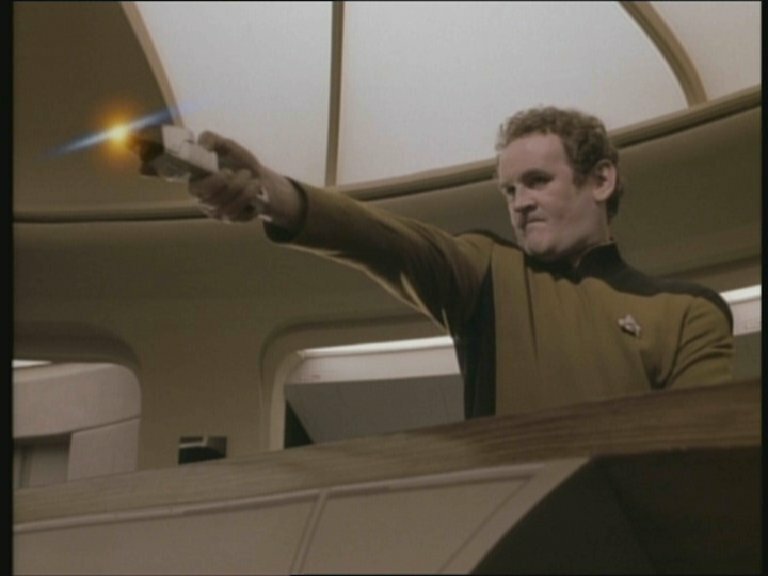 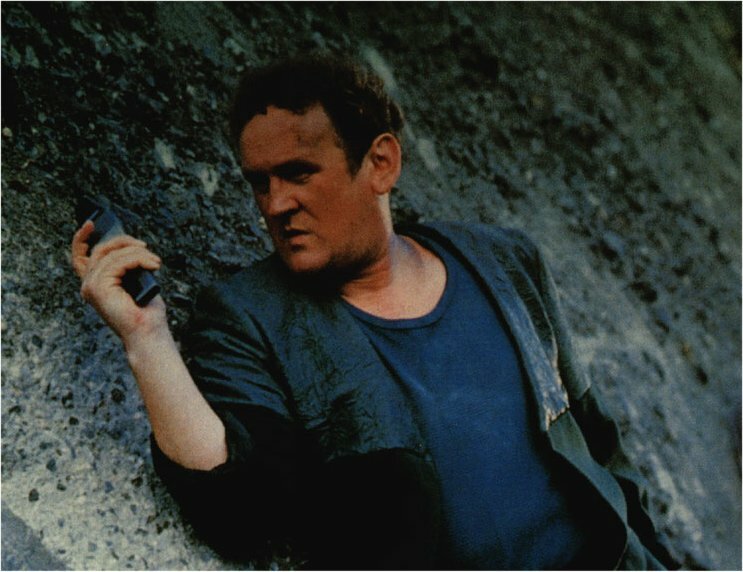 Once again, poor aiming abounds as hapless actors try to aim a nearly-straight hand-held weapon. 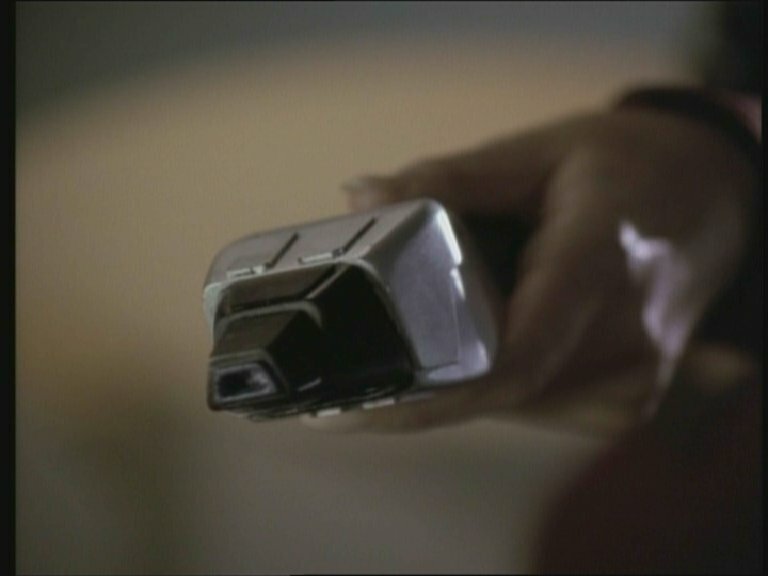 This image being one of the worst examples. 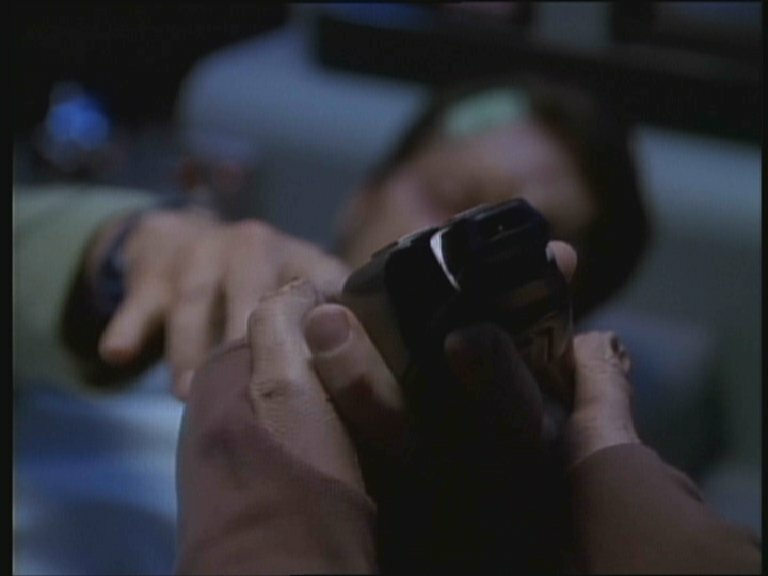 I've been provided with some screengrabs showing some examples of phaser settings: maximum stun, overload deactivation, the power gauge, and the underside hatch open and closed. 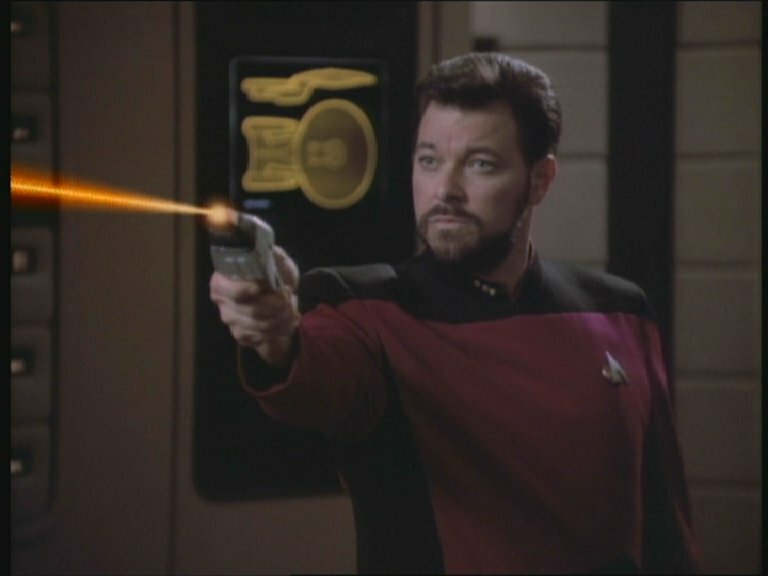 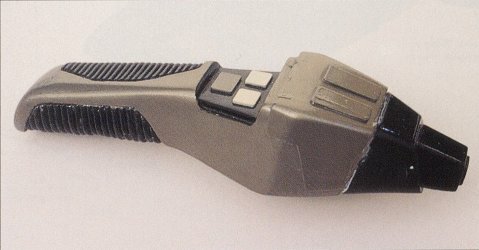 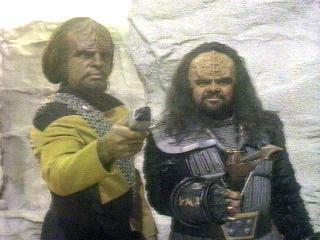 Be sure to read Neil Fraser's instructions for this phaser!